I hear the term casual kilts being banded about quite a bit these days. I have written a page about one particular American company who specialize in these form of kilts, made from cotton as opposed to traditional wool. But these kilts can also be made from wool, and can look as stylish as an authentic Scottish kilt, but at a substantially lower price. So is there a difference between a casual and a lightweight kilt? Well when they are both made from wool, there is no difference other than terminology. But when you look at a kilt made from an alternative material, such as cotton or poly viscose, then I would call it a casual rather than a lightweight kilt. One reason that you might consider a kilt made from poly viscose, is that you can wash it in the washing machine (something I strongly advise against with a kilt made from wool). I personally can't think of any other reason to buy a kilt made from a man made material, rather than wool. Wool after all is a natural fabric which breathes, it hangs well, it is comfortable and when looked after properly will last a lifetime. For further hints on kilt care please click on the link to that page. You can see below a kilt being worn in a very casual manner, proving just how versatile a kilt is compared to any other item of clothing. Most of these kilts are made from four yards of material, compared to a full eight yard kilt, and with the woolen versions (which I recommend) the weight of wool is usually ten or eleven oz. 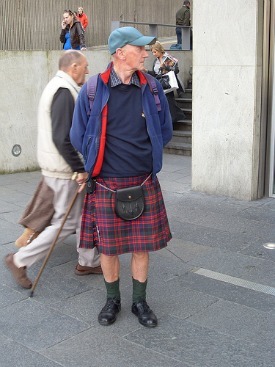 Nowadays many of you are choosing to wear your kilts to sporting occasions, such as football or rugby matches. These are times when a kilt such as this is ideal, rather than a heavier eight yard version. For those of you who live in warmer climates, or don't want the expense of a full eight yard kilt, this could well be a sensible alternative. And don't forget when you team your kilt up with the correct accessories, even a casual one, you then have an outfit that you can wear to almost any occasion, and be guaranteed to stand out from the crowd.